Two months back I had attended a workshop by Purple Foodie on cake baking and other teatime treats. Since then all required ingredients were sitting in the cupboard, waiting to be baked. What stopped me from making any cake was the lack of a ‘kitchen weighing scale’. Baking can be daunting when you read the recipes because all of the ingredients are always measured in grams! Duh! But a few days back, a family friend got me this teeny weeny pocket scale which measures upto 200 gms for Rs. 300. And since then my baking expeditions started immediately since i had already collected all other stuff like cake baking aluminum pan, parchment paper, silicone spatula…. Baking a soft fluffy cake generally does require eggs. Although my mom makes a very delicious rawa (semolina) cake without eggs, it is quite dense as compared to a refined flour cake with eggs. Most recipes call for unsalted butter which is very difficult to find here in India. So I use Amul butter in all my cakes and it turns out perfect, in-fact the slight salt content gives more depth to the flavors int he cake and caramel. 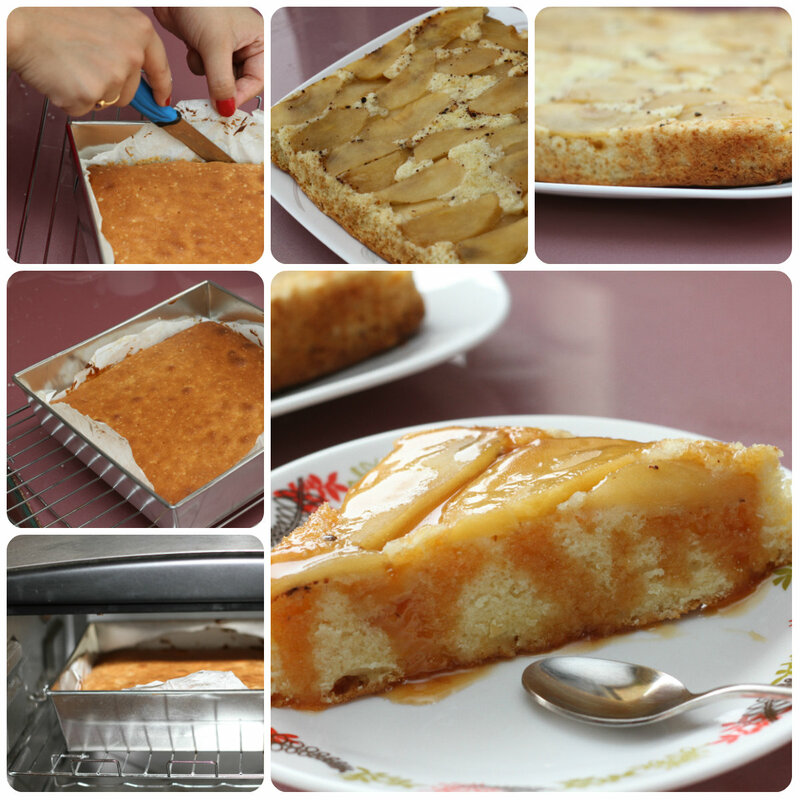 This upside down apple cake recipe has been adapted from Purple Foodie workshop guide. However, the apples can be replaced with any firm fruit like pears, pineapples, musk melon etc. Yield : One 9 inch square cake. Firstly, wash and peel the apples and cut them lengthwise into slices. 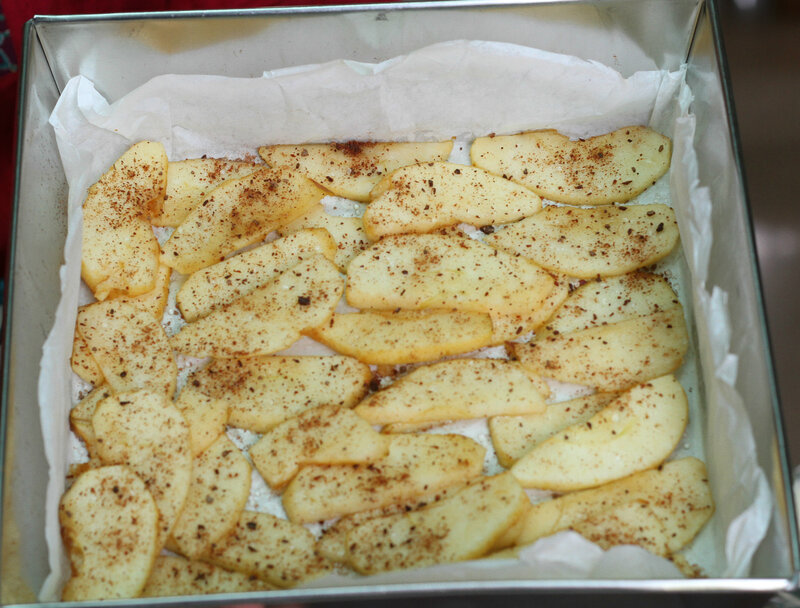 Grease the baking pan and line the bottom with a parchment paper so that the apples dont stick to the bottom, plus it comes out easily. Pre-heat the oven to 190 degrees Celsius and keep it ready for baking. Arrange the apples in the bottom of the pan so that the entire bottom is covered. Apples shrink after cooking, so fit them tightly and then some more. You can add even more apples than what you see in the pic below. Drizzle a teaspoon of sugar and cinnamon over the apples and keep it aside. In a big bowl, whisk together the butter, sugar and vanilla essence. Once that is combined well, add the eggs, one at a a time, whisking vigorously till the batter is soft and fluffy. I used an electric mixer, but you can do it with an egg beater (takes a little more time) or a hand blender. Sieve the flour and the baking powder, preferably twice, so that a lot of air gets incorporated in the flour making it light. 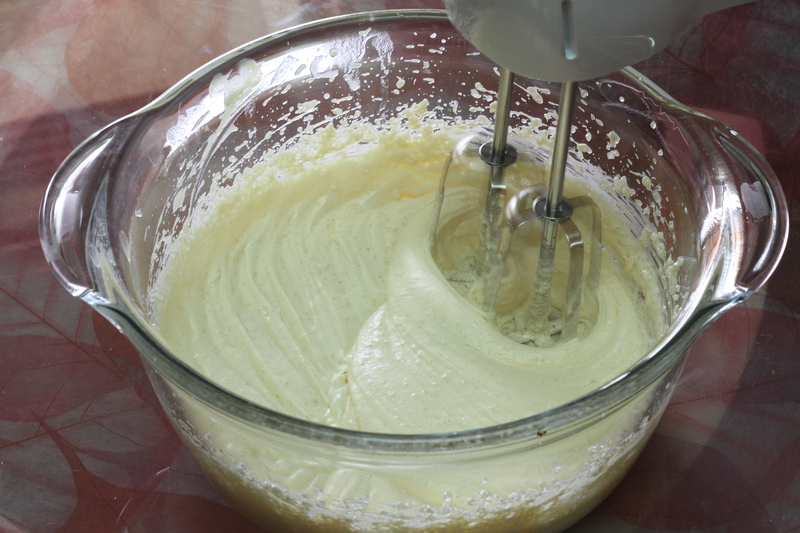 Then fold the flour into the egg and butter mixture and finally stir int the milk until it forms a consistent batter. Pour the cake batter over the apples and set it to bake for about 35-40 minutes @ 190°C/ 375° F, till a toothpick inserted in the cake comes out clean. If sometime while baking you think the top is getting heavily browned, cut a piece of aluminum foil the size of the pan and place it over the pan to continue cooking. Let the cake cool down for 10 minutes. First run a knife along the edges of the cake and then place a plate on the pan and turn the cake over. Tap it slightly and the cake will fall into the plate. Gently remove the parchment paper. Enjoy your freshly baked cake. 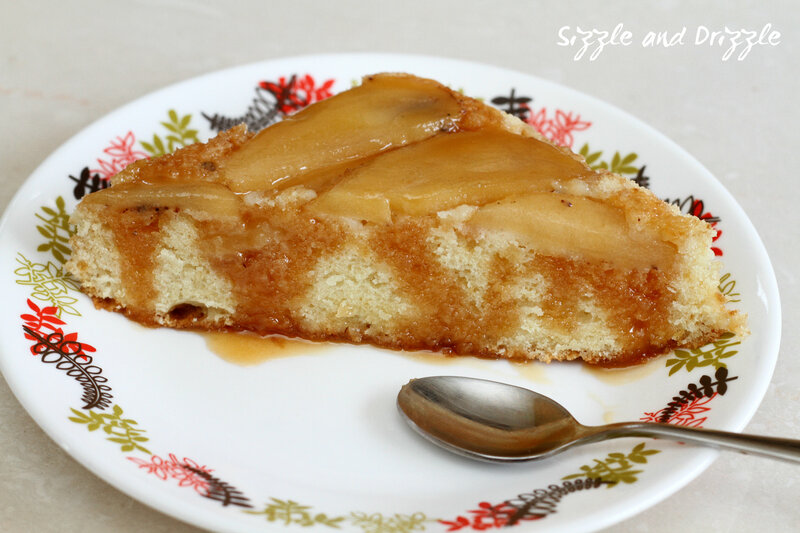 Note : This cake tastes good even on the next day, just warm it up before serving with the caramel sauce. Apr14April 14, 2013 • By Rutvika Charegaonkar • This entry was posted in Desserts and tagged Amul, Apple cake, baking, Baking powder, butter, caramel sauce, cinnamon, Flour, Milk, Sugar, Upside down cake. Bookmark the permalink. Thanks 🙂 try it , its very simple too..
Looks good! Just found your blog and I like what I see. Am following you now!! Thanks Anjana. I loved your very versatile blog too..
Rutvika! this sounds so good. cant wait till i bake it.. also, do you need to use red apples or green apples here? and for the caramel sauce, do we need to use salted or unsalted butter? 🙂 thank you, and I always use Amul butter (salted butter) and regular red apples, peeled for this. But no reason it wont work with green apples.